The UK canals were originally built during the Industrial Revolution to carry cargo - long before motorways and even before trains. Believe it or not, there was once a time when a canal was the fastest way to get goods from one place to another. 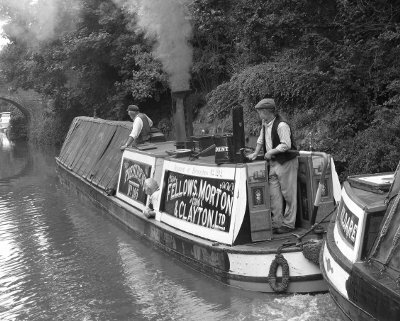 The UK was the first country to get a nationwide canal network. The boats were pulled along by horses - or, when you went through a tunnel, pushed along by men lying on the roof and walking along the ceiling! Canal men and their families lived in a tiny room at the back of their boat. It had to be tiny - the bigger the living quarters, the smaller the load of cargo. After World War II, the canals couldn't compete with the speed of road haulage and stopped being used for freight. Fortunately, many remained open and are now used by tens of thousands of people for boating, fishing, walking and so on. There are probably more people on the canals today than ever! You can read more about the history of the UK canal system on Wikipedia.